ENERGY STAR certified gas storage water heaters are an easy choice for energy savings, performance, and reliability. Read our Gas Storage Water Heater Fact Sheet (PDF, 83 KB) to learn more. The specification covers high-efficiency gas storage, whole-home gas tankless, solar, and high efficiency electric storage water heaters. Products must meet minimum requirements for energy efficiency, hot water delivery, warranty period, and safety. What else should I look for when buying a high-efficiency gas storage water heater? Plan ahead if you can. To make your life easier, plan ahead for your next water heater replacement and you will have time to research and select the best technology for your situation before it's an emergency. Your installer may need time to order the proper model, and it may take longer to install than a standard water heater. Check product availability. Find out what certified models are available on the market by viewing the ENERGY STAR Product List. You will then need to visit manufacturer Web sites, call local installers, or visit your local retailer to determine who carries these units in your area, or call your plumber or contractor to see what products are available. Estimate the capacity you'll need. The amount of hot water a model can deliver under standard test conditions is determined measured by two things: The capacity or volume (in gallons) and the first-hour rating. You can determine the capacity of your existing unit by looking at the nameplate or yellow Energy Guide sticker. If your current water heater meets your needs most of the time, you can probably replace it with one the same size. But also take a look at the first-hour rating of any new model you consider. The first-hour rating measures how much hot water the unit can deliver during a busy hour under standard test conditions. This means you can get better hot water performance without having to buy a larger capacity water heater. Request cost estimates in writing. Check the company with your local Better Business Bureau. See if the company will obtain a local permit if necessary and understands local residential building codes and other regulations. Search for rebates. You may be able to reduce your costs by taking advantage of rebates. Be sure to review the eligibility rules before you make your purchase. 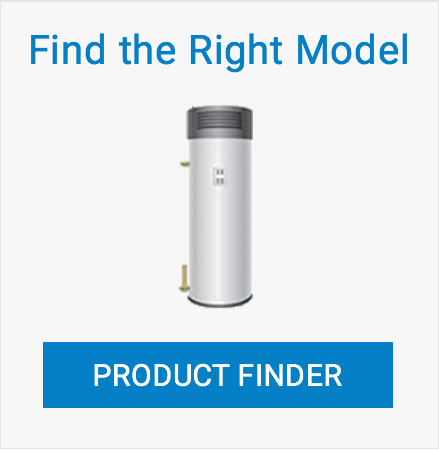 Use the Special Deals Finder to determine whether there are rebates available for ENERGY STAR certified water heaters in your zip code. Consider other measures that may also save energy. If you are in the midst of new construction or home remolding project, you may have come across other proposed approaches to water heating. Under the right circumstances, these technologies can save significant amounts of energy. Water heaters are the second highest source of energy usage in the home. A new ENERGY STAR certified gas storage water heater uses 8 percent less energy compared to standard gas storage models. Those energy savings add up to big savings for the environment by helping prevent climate change. You can save even MORE with rebates. Warm up to savings with ENERGY STAR, right now! 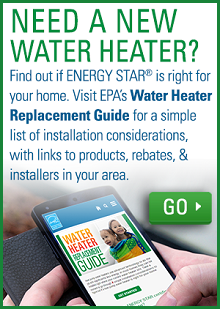 More information and resources to help you choose ENERGY STAR for your next water heater. OVERVIEW: Learn why an ENERGY STAR certified water heater is right for you. SPECIFICATION: Find out what makes a water heater ENERGY STAR certified. BUYING GUIDANCE: Get helpful information to choose the right water heater and make your home more energy efficient. If all residential gas storage water heaters sold in the U.S. were ENERGY STAR certified heat pump water heaters, we would save more than $1.2 billion each year and prevent nearly 10 billion pounds of carbon pollution annually. This is equivalent to the emissions from 900,000 vehicles. Choosing an ENERGY STAR certified gas storage water heater instead of a standard model can save a family of four over $20 each year.